Who could’ve predicted an era where mobile communication devices would become so powerful? Nowadays, our smartphones (aptly called smart) have transcended their mere and mundane usage as communication devices. While writing this article, my mind immediately conjured up an image I saw on some social networking website. The image depicted 80’s era and appliances that were considered high-tech back. Gadgets like walkman music player, electronic calculator and last not least earliest Atari game console littered around! In stark contrast, the other portion of the image depicted today’s era with just a smartphone replacing all these. Smartphones have become a viable gaming option on the go! They are now home to almost all genres of games one expects to find on consoles and any other mainstream gaming platform. Be it role playing games, horror survival games, first person shooters and my favorite car racing games! You’ll find it all specifically made for your smartphone. Although there are many car racing games but Need for Speed franchise is a time honored and one of the most phenomenal games. No other game comes close to capturing the adrenaline rush and portraying the elements one might expect to experience during a high speed car pursuit better than these games. It may not be open world but most wanted has all the ingredients that will get your pulse racing and heart throbbing. It’s the epitome of old school racing game. Having said that, the game makes full use of smartphone touch screen capabilities and bestows a lot more control over vehicle than simply speeding up and breaking. Players have the option to either use the tilt based control functionality to maneuver the vehicle or use the touch wheel option. Visually stunning and sleek, it contains the same quality visuals you’d find on its console version. There are a lot of micro transactions built in the game to avail the good content and upgrades, but I think overall it’s impressive and the nudge to make in game purchase doesn’t mar the overall experience. Does the sight of high performance cars like BMW and Lamborghini racing down tracks excite you? If the answer is yes, then the latest installment of Need for Speed titled Shift is definitely something you’d want. You’d have 18 splendid tracks located around scenic mega cities of the world at your disposal. Adding to the fun are numerous customizations and upgrades to fine tune and tweak your car according to your taste. Lastly, the thing that will strike most players is the amount of detail in the game. Physical realism is taken to new standards which have to be experienced to believe! For me, the highlight of the latest Asphalt game called Heat is the amount of content squeezed into it. There are over 60 exquisitely rendered cars from top manufacturers like Ferrari, DeLorean and Aston Martin rendered in magnificent details. The multiplayer lets you burn rubber with up to 5 friends online or locally. The best part is, unprecedented 6 game modes with 15 leagues and 150 different races. Be warned though! Yhe difficulty settings would push your driving capabilities to the limit. But after completing a difficult race, the feeling of accomplishment is unbeatable. Real Racing also comes from a line of what you may call “pedigree racing family”. Almost every game in the genre boasts of having their in-game vehicles modeled upon their real life counterpart, but this game takes it up a notch! Real Racing 3 contains original real world racing tracks in multiple configurations from racing locations around the world. You’d be speeding down tracks on locations like Hockenheimring and Mazda Raceway Laguna Seca! If that doesn’t tickle your fancy you have 50 real world racing machines at your disposal too. Some readers might object to the inclusion of this game in the list. Sure, it doesn’t feature real world multimillion dollar racing machines or exotic racing tracks. But, it does have all the pulse racing and teeth gritting action of a full-fledged racing game! The twist is, you’d be racing beach buggies instead. The environments are meticulously detailed and react well to the destruction and the mayhem you’d wreck with your buggy. Plenty of nifty vehicles to unlock and plethora of upgrades to customize your buggy to your liking. The distinctive feature of this game as evident from the name is racing in a straight line. It may sound sub-par when compared to other games, which offer twisting and turning tracks, but believe me, it takes some practice to even finish in the top 5 at first. There’s also an online section where you can compete with your friends or race against strangers. My favorite is the 9 player race which I have mastered after several weeks of trial and error approach. If you are bored with playing the regular run of the mill racing games then this game might be something you’d really like. No overhead perspective or chase camera, what you get instead is isometric view of the proceedings. Whacky stunts and jumps, detailed upgrading of your machine and paint job make this an immersive affair. Oh and bumping other drivers off the track is not penalized instead it is encouraged! The weather conditions are subject to change, making the game that more exciting. 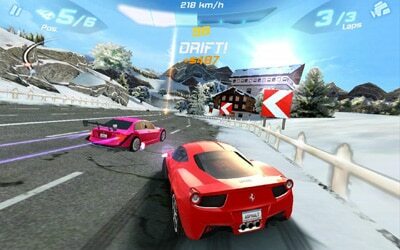 Real Racing franchise can be termed as the royalty of car racing games for android platform. My favorite is the original game and its third installment! Both are known for great simulation and awesome graphics. Real racing three is what the name implies! Graphics and visuals are so realistic and crisp that you’d be forgiven for thinking you are actually sitting in the driving seat yourself. The download size of 1.7 GB (a bit unconventional for an app I know) is jam packed with content like 45 licensed cars, detailed upgrade system and my favorite gaming engine, which renders damage dealt to the vehicles in meticulous details. You get shadows, reflections, rare view mirrors and much more. Definitely worth the download size I’d say. Do you have that competitive spirit? Would you like to go toe to toe (OR wheel to wheel in this case) through a splendid multiplayer mode with other drivers? Driving through locations such as the Great Wall of China, slipper and extremely tricky to negotiate snow covered mountainous roads? If your answer is yes, then this is just what the doctor ordered for you! Raging Thunder 2 is an awesome successor to first raging thunder game and makes better all the elements of the first game. Did I mention that it contains cutting edge and very realistic 3D graphics? There is no better adrenaline pumping feeling than riding in a monster truck and making leaps over deep bottom less chasms! 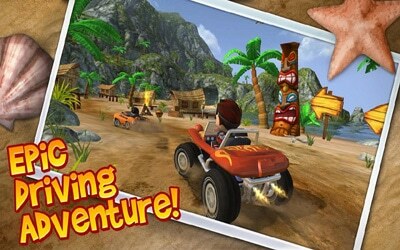 Off Road Legends as the name implies is a different sort of racing game. There are no internationally recognized tracks to speed through; just off roads and back roads. The game is packed with a lot of content. There are four vehicle categories to select from like monster trucks, off roaders, behemoths and fun cars. There are 56 grueling off road tracks to conquer and three game modes. If you are looking for something different and apart from mainstream, this game should be your choice. Based on the latest iteration of Fast and the Furious movie, Fast Five is a game that will definitely appeal to the fans of the film. Fast Five lets players take control of some of the best vehicles from the movie. As its name implies, the game is fast paced with silky smooth controls. It features a carrier mode in which players take on various challenges on different locations such as streets of Rio, Hong Kong and many others. There are 10 chapters to unlock and play through, and as the game progresses further, players will be able to unlock new cars and take part in different challenges like drifting and drag events. Fast Five is a must have game for fans of the movie and those who enjoy playing arcade racers. As the name suggests, this game plays out like a driving school or a career progression of a novice driver culminating in the driver becoming a champion racer. The game is versatile as it offers two paths to attain champion driver status. You can do it the traditional way; clear all the challenges and overcome all the obstacles. Or if you feel that would take too long, you can cough up some real world money and buy your way to the top of the heap. In my opinion, the latter option mars the entire experience of the game and should be avoided. There’s no alternative to playing, occasionally failing and achieving glory at the end of the game. The choice is yours should you choose to invest money in this title. Top points for being immersive and addictive though no matter what option you choose. I simply couldn’t help it! This game franchise is just that good I had no option but to include the earlier version too. Salient features include: 6 player multiplayers online and on local multiplayer, 11 different leagues and 55 different events. It’s also got enough customization options to satisfy even the most cynical of racing genre! What more can you ask for? Oh and there are bikes too from numerous world famous manufacturers that you can stash along with your cars in your 3D garage. The modus operandi remains the same but instead of cars racing in a straight line we’ve got super awesome sports bikes. The game mechanics are simple! Win races, gather cash and upgrade your ride. To ease yourself into the game, start with training mode; do a quick race and then delve into career mode. If you feel confident enough, go online and compete in tournaments to test your skills. There’s a lounge section where you’d be able to check on your stats and details of the awards earned. Overall, a fun filled extravaganza! What do you get when you throw in bounty missions, exquisite visuals and scenery of the desert during different seasons? 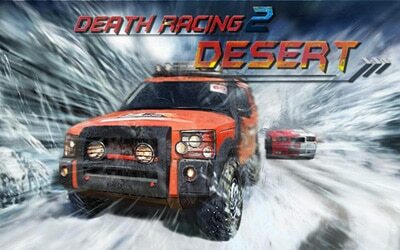 The answer is, you get Death Race 2 Desert! This game has simple touch controls and almost no learning curve and lengthy manuals and tutorials to go through. It wouldn’t be farfetched to claim that this game takes inspiration from some of the best racing games in the genre and adds it own touch to the proceedings. 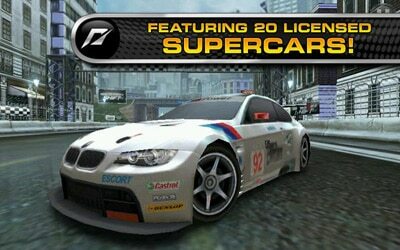 As staple feature, there are lots of fantastic cars to unlock and score multipliers to achieve by accelerating. Want to feel the night breeze in your hair and the adrenaline rush of riding a high performance car? You do not have to be a millionaire (or a law breaker for that matter) to achieve that! Presenting Speed Night 2, the answer to all your midnight adrenaline racing cravings. Simplistic controls and earning gold coins littered around the road are the hallmarks of the game. There are also zany powers you can unlock by earning enough gold coins such as missile used to blow your opponents to kingdom come. If that doesn’t satisfy your lust for speed, there’s online leaders board, where you can compete with other nocturnal speed racing junkies from all corners of the world. Drifting is dangerous and risky but it is the most coolest move one can pull with their vehicle! Need for Drift, the name says it all. 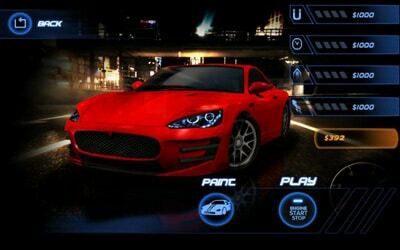 Sitting behind the wheel of a high performance racing car, partaking in illegal street races and drifting through scenic routes are the mainstay of this game. There are over 100 tracks and 30 cars to test out. A word of caution though! The AI plays hardball and won’t be giving any corners, so you better get your A game On to make any progress. The controls are simple as evident from the screenshot and the fun is unlimited. The graphics are on par with most leading racing games of this generation. Overall an adrenaline junkie’s paradise! I just couldn’t help myself including another one from legendary Need for Speed family. Hot pursuit deserves its spot on this count because of its highly addictive gaming modes. You can choose to be an outlaw outrunning in cars like Pagani Zonda Cinque or be a law enforcer hunting down miscreants in cars like the Lamborghini Reventon. I always play as cop which puts nifty arsenal at my disposal like EMP lock and spike strips. As an outlaw, you can use oil slicks, overdrive and jamming to give cops the slip. Pulse pounding and heart racing action folks! For the last entry on this list I thought I’d include a game with a different type of racing vehicle. The first thing you’d notice about Riptide GP is the jaw dropping graphics and water physics. It’s like actually sitting atop your jet powered water scooter and cutting through the waves. A must have for all those who appreciate real world physics coupled with stunning graphics in a video game.